recruitment of UIIC Administrative Officer. 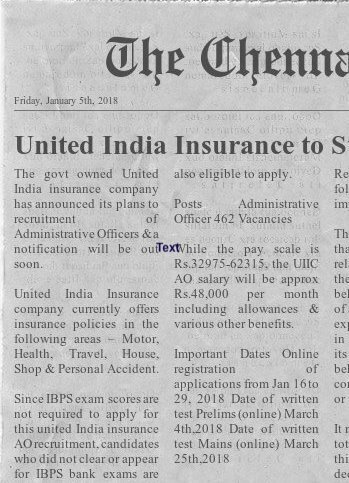 Eligible and interested candidates can apply online through the official website of United India Insurance Company Ltd @http://www.uiic.co.in/ from 16-01-2018 to 29-01-2018. Online applications only allowed no other mode of applications are allowed. For more information regarding this recruitment of UIIC AO General/Specialist please see the information given below. UIIC is the leading general insurance company in India owned by Government of India. 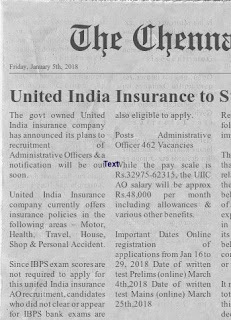 At present UIIC having 1600 offices and it is providing major insurance concepts of Health Insurance, Travel Insurance, Motor Insurance, Personal Accident, Householders Insurance and Shopkeepers Insurance etc. Currently UIIC consists of more than 200 tier 2 and Tier 3 villages and towns through micro offices. United India Insurance Corporation Ltd crossed 12000 crores premium income. There are total 462 vacancies available in this current recruitment of UIIC. As on 31-03-2016 candidates age limits are 21-30 years. For SC/ST candidates 5 years, For OBC 3 years and for PWD candidates 10 years of age relaxation is given. The candidate must have qualified Bachelor's degree from a recognized university for the posts of Generalist category Administrative Officer. The candidate must have qualified Relevant Bachelor's degree from a recognized university for the posts of Specialist category Administrative Officer. Selection for this recruitment of UIIC Administrative officer will be held based on Competitive exam and Personal Interview. Selected candidates have to undergo for a period of one year of probationary. Further it will be extended to 6 months. Eligible candidates can apply online through the official website of UIIC Ltd @http://www.uiic.co.in. Must have provide a valid mobile number and mail id at the time of online application. Read the official notification before applying and online. Click here to see the notification of UIIC Careers Administrative Officer Recruitment.. Apply here for UIIC Administrative Officer Jobs. Please share this information with your friends via the social media.